LucidSound LS30 reviewed primarily using the PS4, Xbox One, and various mobile devices. Name a few characteristics that come to mind when thinking of gaming headsets, and likely the results will include garish, toy-like looks, questionable features, and for wireless models, a decided PlayStation vs Xbox positioning. 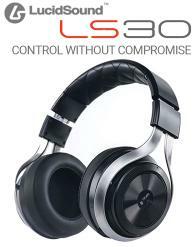 Into this arena comes a new company, LucidSound, with their first product, the LS30 Wireless Stereo Gaming Headset. The bona fides of LucidSound can be traced back to the founding and enduring establishment of the Tritton gaming headset brand. That kind of ancestry helps in a press release, but this is what have you done lately kind of business. The LS30 is a wireless stereo headset that promises support for a surprising set of four consoles, the PS4, Xbox One, PS3, and 360, and that's just the beginning of the somewhat unique feature set promised by the new headset maker. The LS30 first caught my eye in Las Vegas during CES 2016. It was hardly the only headset or even gaming-focused headset around, but the table-sized booth was abuzz with activity. Not only could the headset be handled and used, but there were portable console set-ups at the booth. A number of things grabbed my attention and brought me in, but brand certainly wasn't one of them. No doubt the headset's look is a far cry from standard gaming fare. Even some very austere studio style gaming headsets really don't look much like the LS30. What grabbed me, however, was the USB base station. The slightly larger than a flash drive USB transmitter is connected via cable to the console's optical connection. Such a connection is a strong indication that a headset maker is looking for a good signal to start out with. Furthermore, as was quickly confirmed to me, using optical allows the headset to have independent game and chat volume levels. The next thing I noticed and a feature that stuck with me, was the LED light on the boom mic. It lights up when the mic is muted, and it's quite visible for the wearer. This is an interesting feature and it solves the problem of worrying about if the mic is really muted. It certainly feels smarter than having to disconnect (or flip or retract) the mic to be certain that mic is not live. Of course, testing anything wireless at CES is generally a hopeless exercise. Using wired mode is better, but there is still the competition of an entire event occurring around you. Fast forward, and receiving the review unit was almost like getting to see the headset for the first time. As much as I like the novelty of the mic mute light, as it turns out it's quite low on the list of important features. In spite of the obvious appeal to style, the LS30's most important features break down like this. This is a stereo-focused wireless headset. Optical is used to get uncompressed stereo LPCM, which is then transmitted to the headset. Next in the rank of importance, the LS30 is a wireless headset that is meant for use on both the PS4 and Xbox One, and in fact PS3 support and even 360 support is a highlighted part of the feature set. The LS30 is fully wireless (game and chat audio) on the PS4 and PS3. On the Xbox One and 360, game audio is wireless while chat comes via a cable connected to the controller. (As the majority of headsets are with the MS consoles.) The headset actually comes with a cable whose sole purpose is to get chat audio from a 360 controller. Coming in tied for third is the aforementioned look of the headset, and the way it controls. The power button is on the left underside with an EQ button on the right. There are three EQ modes, Normal, Bass Boost, and Treble Boost. On the outer left side is the game volume wheel. Turn it forward for an increase, and back for a decrease. This is a nice design, but I what I really like is that when you push in the outer left side, it activates the game mute. I hadn't really care for this feature at all when I saw it in the manual, but in practice it's indispensable. I was playing Terrorist Hunt in 'Rainbow Six Siege' on the Xbox One with a group of chums from the UK. Nothing helped me cut through the gaggle of accents and questionable mic choices quickly like being able to mute the game audio with the press of a button. On the right side is a similar arrangement. There's the outer wheel for chat audio level and when pressed in, that activates the mic mute. Aside from the power and EQ buttons being a little plain looking, the controls are all spot on. In 'Rainbow Six Siege' the audio performance was wonderfully good. The game has a very important strategic nature to noise, and damn if the LS-30 doesn't make the most of it. I also used the LS-30 for an 8 Level run through 'Tom Clancy's The Division' open beta on the PS4. That means that every time one of NPCs wailed because my team and I had got "Alex," I could hear it. I'm a huge fan of surround sound headsets, but I know that stereo has its own potentially excellent spatialization qualities. In the LS30, the people that I've heard time and time again who wish for a wireless headset that is high quality and doesn't suffer from processing should find their champion. As I stated before, the stereo performance is the LS30's biggest strength by far. I had no trouble with the battery life, and I found that the headset is good about powering off when not connected to a console. It's uncanny how much the LS30 nails the look of a lifestyle headset. While I'm glad it doesn't look like a plastic pool toy, the look still took some time to grow on me. What really helps is that the headband, starting from the material up top and going down into those cool to the touch metal loops, feels good. With the wiring carefully set into the metal, it looks like it should hold up to lots of wear and tear. I was surprised at first at how firm the headset felt when worn. I don't mean painful, but it holds itself in place in a surprising manner. It didn't really get why this was the case using it on the consoles, but when I connected it to my phone and went walking, the reasoning became clear. That annoying thing that so many headsets do when they slip down while moving is reduced to a minimum with the LS30. The snug fit never bothered me, though I would recommend pulling down the ear cups (adjusting the headband) before wearing the headset for the first time. I sort of skipped this basic step and the feel was not great. Once I adjusted the headband, the fit was good. When away from the consoles, the LS30 turns into a passive wired model. A 4 pole 3.5mm to 3.5mm cable is included for this. (It's the same cable used for chat with the Xbox One, either with a chat adapter or a newer controller.) To dramatic effect, detaching the mic does give the headset a nice look. Stylish, but thanks to the coloring, still somewhat sedated. There is a mic built into the left ear for making calls. This is not a bad feature, but it does leave the headset without any kind of send/end or play/pause button. As for the detachable boom mic, I've found that it badly needs a windscreen. Without a windscreen and very careful positioning, the mic will pick up a lot of breath. It is easy enough just to stick a foam screen on, but there ought to be one included. The pickup is good otherwise, clear but not too sensitive. There is another funny thing about the headset involving the detachable mic. The packaging includes two small caps, either one of which can be used as a dust cap for the detachable mic jack. The caps are small, dark, and begging to be lost at the first moment. They are easy enough to ignore at rate. Anyone who has been seeking a quality stereo rechargeable gaming headset that works with both recent generations of PlayStation and Xbox consoles should immediately seek out the LucidSound LS30. The other big aspect, that of styling, can then feel like a bonus. There are some small things I would change, but based off the LS30's performance and feature set, the brand is an up and comer.